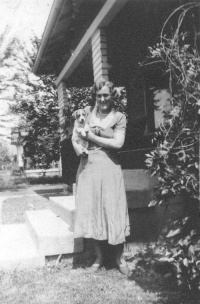 Hazel Cardwell (Brumbach), Hope Branham's mother. William Branham told a very emotional story of how he asked Charle's Brumbach for Hope's hand in marriage, while Hope asked her mother, Hazel Branham, if she could get married. What is surprising is that the story cannot be true as William Branham retold it, as Charles and Hazel Brumbach were divorced at the time, and Charles was remarried. 2) Charles and Hazel Brumbach divorced on November 1, 1931. 5) When William Branham married Hope in 1934, the marriage license indicates that her father's residence was in Ft. Wayne. 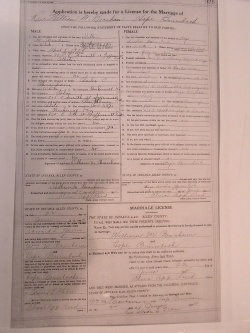 William and Hope Branham were married in Ft. Wayne, not Jeffersonville (see marriage licence on right). 6) Hazel Brumbach (Hope's mother) married John Cardwell on August 22, 1935. 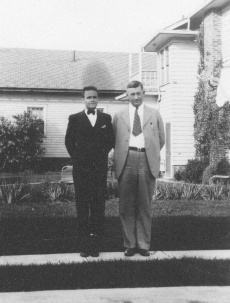 William Branham and Charles Brumbach, Hope Branham's father. But one more thing. When she was... I remember she told me I had to ask her mother for her. Oh, my. I said, "Honey, look. Let--let's you and I make an agreement. See, we're supposed to be fifty-fifty on these things. You ask your mother, and I'll ask your daddy." She said, "All right. Very well." I said, "That's all right." And so, I thought I could get by pretty well with Charlie, 'cause I'd... He liked me real well. And I... He understood me more. So that night, I remember I had to ask. I sat there and I... My, I wasn't having me a good time at all. He was playing the victrola, you know. And I went outside. I got to the door, and she looked at me. You know, I was going to go without asking him, you know. And I said... And Charlie was setting there typing on the typewriter, you know, and it was nine-thirty. Time I had to go...?... He said... I walked to the door, and I said, "Hmmph, Charlie?" He said, "Yes, Bill." I said, "Uh--uh... Could I speak to you out here just a minute?" He said, "Yes?" He looked over at Mrs. Brumbach, and she looked at me, you know. Oh, oh, oh, oh. And I said, "Here's where it all ends is right here." We went outside. Then I thought maybe that Hope had already told her mother, and her mother had done told him to say "No," you know. So I had it all fixed out how it was going to be. "Well, how are you, Bill?" I said, "Oh, pretty good." I said, "Sure is a nice night tonight, isn't it, Charlie." He said, "It sure is, Bill." He said, "Yes, Bill. You can have her." I started... Oh, my, what... I like him yet today. He just went home to glory a few weeks ago. God bless his soul. You don't know what he saved me then. I said, "Charlie, look. I'm as poor as I can be. I'm working down here in a ditch for twenty cents an hour." But I said, "I love her with all my heart. I can't clothe her, and feed her, dress her the way you can. But, Charlie, I'll say this: I'll be as good to her as I know how to be. I'll work until my hands run blood to make her a living." He put his hand over on me, he said, "Billy, look. I'd rather you to have her and be good to her. After all, happiness does not consist of how much of the world's goods you own, but how contented you are with the portions that's allotted to you." That's right. I said, "Well, Charlie, I'll be just as good to her as I know how to be." And we was married. And when we got married, we didn't have nothing to go to housekeeping with. We was very poor. I didn't... I--I was the one married her, and she was the one taken me to... 'for I to support. And we were happy, just as happy, some of the happiest days of my life. So I walked to the door, and she walked over to the door with me. And--and I said, "I will come up Wednesday for church?" And she said, "Uh-huh," and she just kept squeezing my hand. And she pointed to her dad. I said, "Oh, I couldn't do that." I waited a little bit, I said, "Well, I got to." I said, "Mm [Brother Branham clears his throat loudly.--Ed.] Mr.--Mr. Brumbach?" He was typing along, you know, he said, "Yes!" I said, "Could I speak to you out here just a minute?" He said, "Yes, Bill, why? What do you want?" I said, "Could I talk to you out here just a minute, Mr. Brumbach?" He said, "What do you want, Bill?" And I said, "Sure is warm tonight." And he said, "Sure is." And I said, "But, Charlie, it's a pretty night, ain't it?" Said, "Yes, it is." I said, "You know, hum, uh..." I said, "I was a..."
He said, "Yes, you can have her, Bill, you can..." I--I think a lot of him yet today. I said, "Do you mean that I can...?" Oh my, took a hold of that big old fat hand of his; I said, "Charlie, look," I said, "you know I am pauper." I said, "Your girl can dress nice and everything, and I have one suit of clothes." I said, "But all my life I've been a vagabond, I've been in search for someone that I thought was a queen, one that I thought was a lady." I said, "I found that in Hope." I said, "I--I can't make her a living like you will, certainly not, Charlie, you make five hundred dollars a month and I'm making about fourteen dollars a week." I said, "I got nine down there in the family, some of them beginning to work now," I said, "which will give me a relief. But Charlie, I thought that there was no need in me taking much more of her time. As soon as the other boys get jobs and things can help me with... take care of my mother, I will--I will do everything that I can. I will work, Charlie, as long as there's breath in my body, I will slave and do everything I can, 'cause I really love her. And I will do all that I can to be good to her. I will live true to her; I will do everything I can." I never forget, the man's gone on now. He put that big arm around me, pulled me up close to him, just about the size of Brother Baxter. He reminds me a lot of him. He pulled me up to me like this; he said, "Billy," he said, "I'd rather you would have her on them grounds, than somebody that would mistreat her, no matter how much money he had." Said, "You'll be more happy." He said, "Happiness does not consist of how much the world's goods you own, but how contented you are with the portion that's allotted to you." I said, "Thank you, Charlie, thank you." When we got married, it was--it was a marvelous little old... I remember we was married down here at Fort Wayne, Indiana; we went home. So I went up to her house, and I, that night, and set up there. And I got ready to go. We was all setting, and Mr. Brumbach was setting over at his desk typing off something, you know. And oh, my. I just thought I'd stay all night. So finally got time, I had to say something. So I said... Got nine-thirty, that was my time to go home. How times have changed. So I said... I got up to go home, and so I said, "Good night, you all," walked out. And Hope walked over and said, "Didn't you--didn't you ask? Why don't you ask him?" I said, "Oh, I just can't." I said, "I just can't." She said, "Well, you got to ask him." And I said, "Well, you take your mother and go in the other room." And she said, "All right." So she went back and said, "Mom, would you come out here a minute?" So I stood there at the door a little bit. And I said, "Charlie?" He was writing on something. He turned around and said, "Huh? What did you say, Bill?" And I said, "Could I--could I speak to you a minute?" He turned around and said, "Yes, why? What's the matter. Bill?" And I said, "Would you come here just a minute?" And he said, "Yes." He walked out on the porch. And oh, I was sweating and my heart beating so fast. And I said, "Sure is a pretty night, isn't it, Charlie?" He said, "Sure is, Bill." I said, "I like these kind of nights." He said, "You can have her." How he spared me. I said, "You mean it?" He said, "Yes." I said, "What about her mother?" He said, "I'll take care of that." I said, "Thank you, Charlie." I said, "Now look, Charlie," I said, "I know you can get her good clothes and everything. And there's probably many more boys around here who could make her a better living; and she's a pretty girl, and a nice lady," and I said, "any--anybody would want to go with her." I said, "I don't know just how breaks ever happen like that for me." I said, "Charlie, there's nobody in the world loves her any more than I do." I said, "I can't do for her like you can, 'cause I don't... I only make about twenty cents an hour." I said, "Charlie, I'll work as hard as I can, and do everything that I know is in my power to make her a living and be good to her." I never will forget. And he laid his (He was a German, and me an Irishman, and we was always...?... one another.) laid his big hand over on my shoulder, said, "Bill, I'd rather you have her than anybody I know of." He said, "Life don't mean what you've got. It's how contented you are with what you have." I said, "Thank you, Charlie. I--I love her." And I said, "I'll be good to her, and true. And I'll work as hard as I can for her." He said, "I believe that." We got married, moved into a little two room place. I never forget what we bought to go housekeeping. And I'll be done just in a minute. ↑ Searching for Vindication Timeline re various marriage and divorce documents. This page was last edited on 22 August 2015, at 04:41.